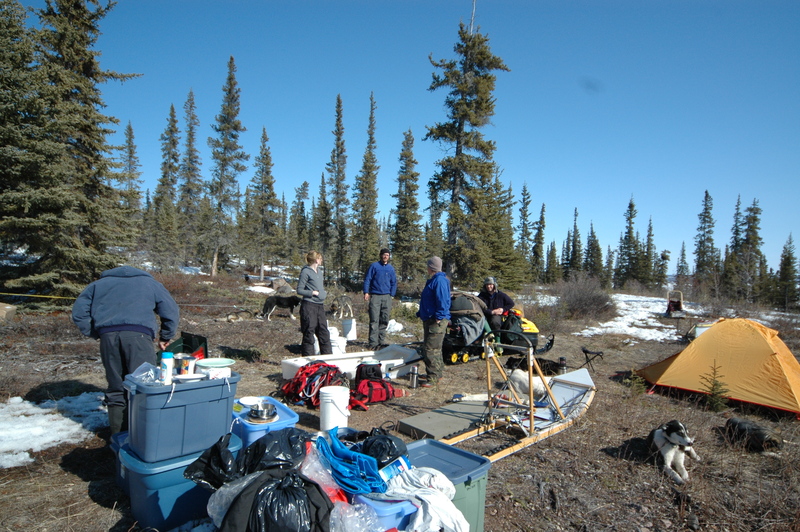 I think I will just let the journal entry and pictures do the talking today other than to say the idea was to take advantage of snow machines and move the bulk of our expedition stuff and half the dogs to the first campsite on the edge of Great Slave Lake. 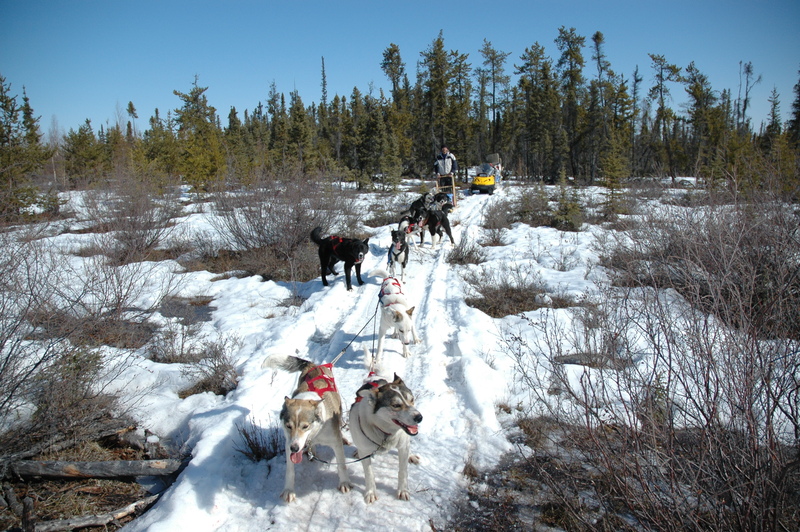 We already knew the portages would be almost void of snow and feature mud, rock and lots of water which makes for miserable dogsledding. 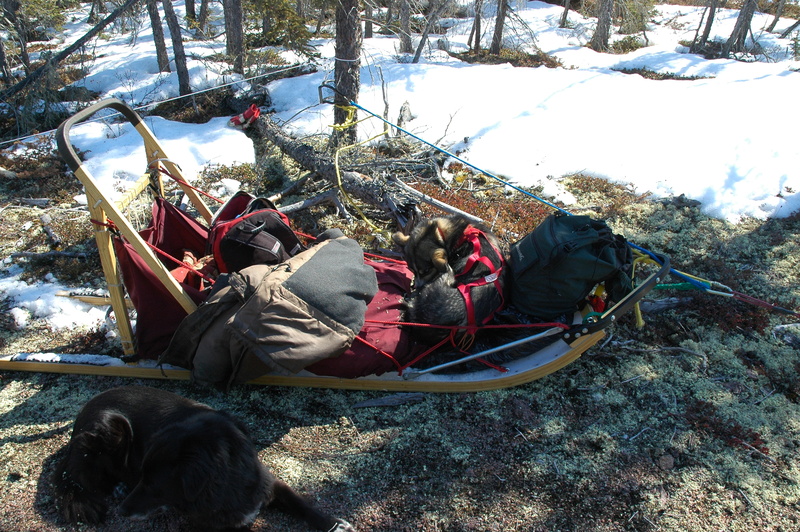 Joc volunteered to stay with the gear and the dogs which meant the following day we could travel light over tough trail. “The day can be summed up by saying “Holy crap!” It’s been a long but satisfying day. First was the last minute packing, sorting etc. Both James and I took the opportunity to develop, well a bad stomach, at the same time! Hopefully just nerves. “Hook up was ok. My team behaved themselves but Patch decided chewing was suddenly a great idea and then Spike and Gump got into back to back fights. This was the exit chute from the dog yard with little snow. I tried not to thing what it was going to be like driving a powerful team from there! The teams crossing the lake. The first portage is off on the horizon. “Before the hookup we did a tobacco offering and mine was offered at Cubby’s old circle. (Cubby was one of my lead dogs who had died suddenly the previous fall, four days after whelping a litter of puppies). I miss her and am sad to leave her behind. 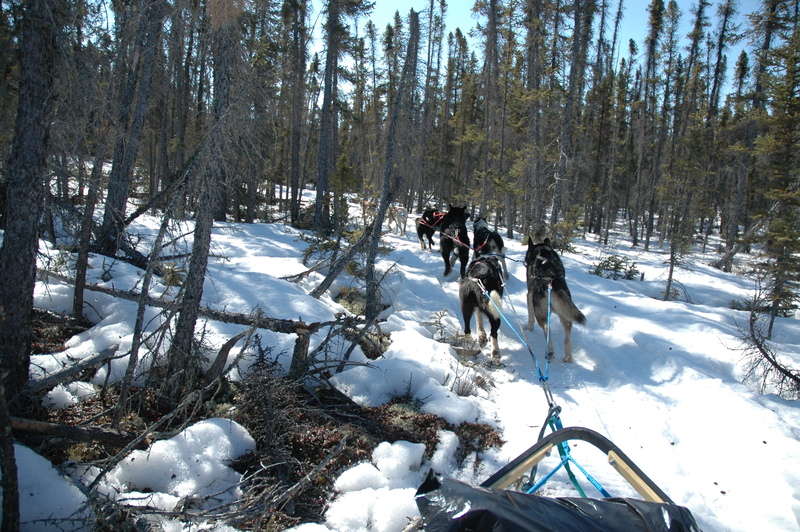 “The start of the trail was rough and neither Lingo or Greedy is a command leader so we didn’t exactly head in the right direction out of the chute. But once we were under way, things got better and those two boys proved their mettle by running through mud, rocks and sometimes patches of snow. 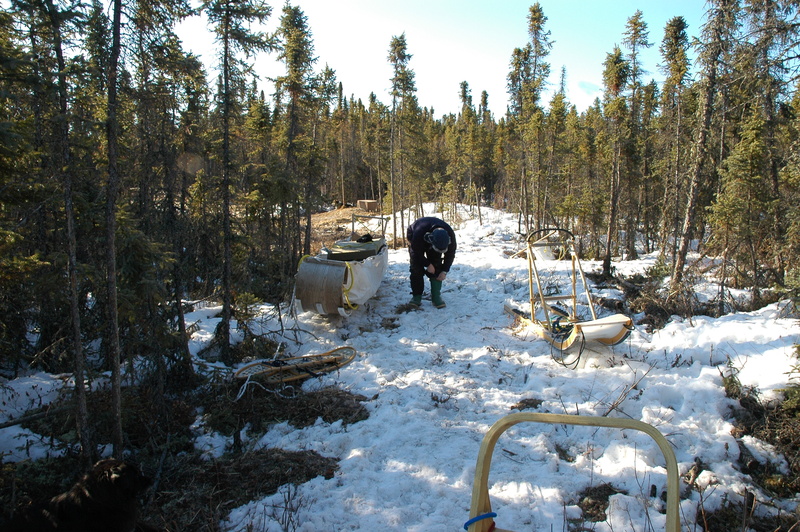 Not much snow on the portages which meant stopping the teams or even slowing them down was a bit of a challenge! We ran into a small glitch on this pond. When the dogs can’t discern a good trail they like to follow the shore. Can’t say I blame them! Joc and Tim discussing the best route around the huge amount of melt water just ahead of them. We ran into several of these. 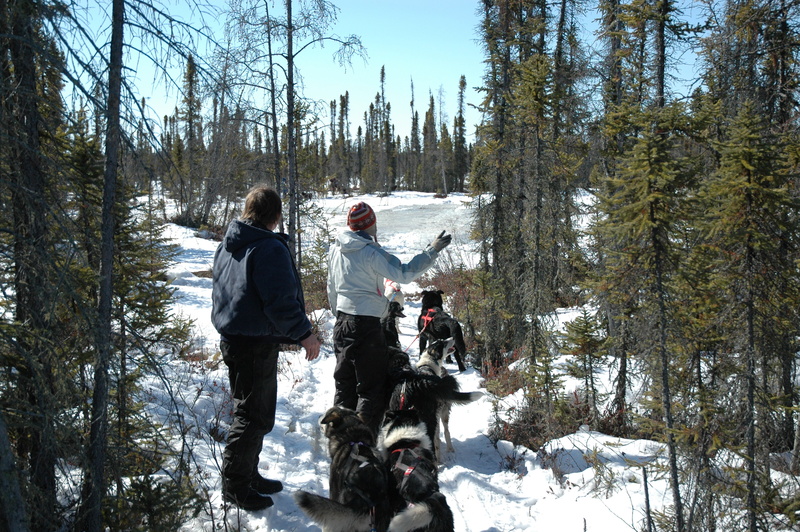 “The trail was really technical because of the lack of snow. 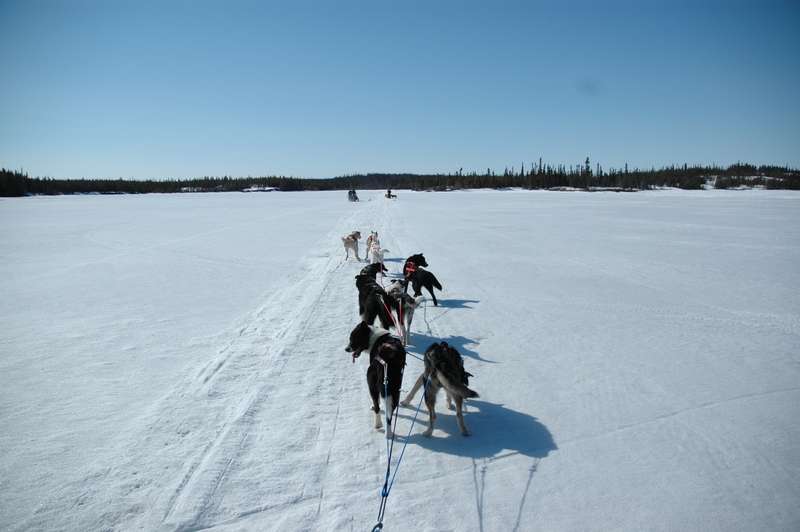 Pretty crazy dogmushing really. Lead dogs Sister and Dexter take a break. They were a mother/son team. Sister is gone now and Dexter is an old, old man. In the spring the snow can get really sharp and crusty so checking feet is a must! Taking a break on one of the portages. Did I mention there was a lack of snow? 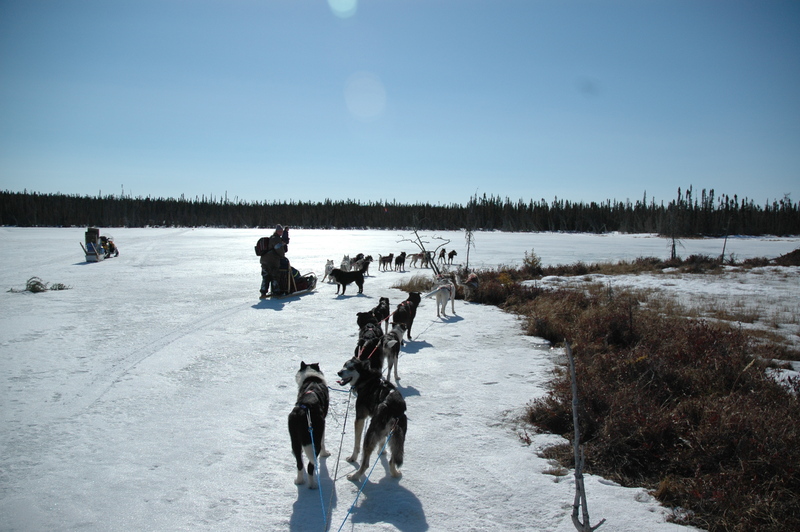 Bubbles takes her break in the sled while Caleb chooses a spot on the ground. 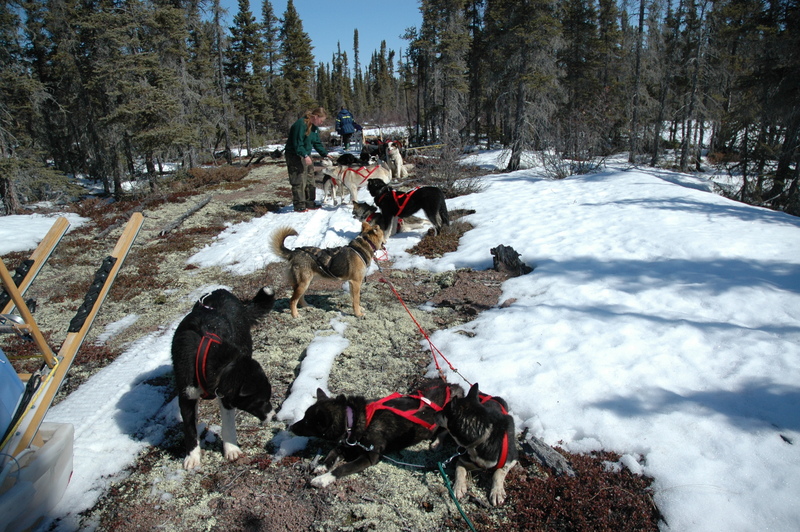 The dogs at the first camp. 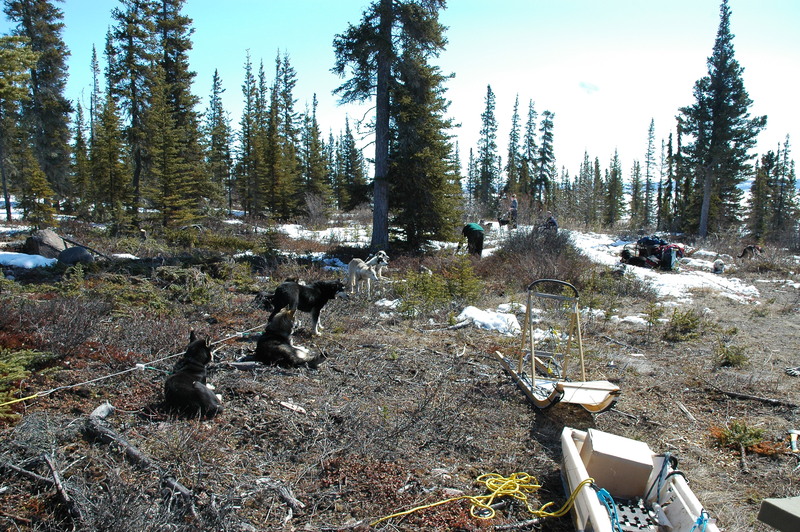 The picket line spaces them out and gives them a chance to rest after a good day on the trail. At the first camp. Joc spent an uneventful evening here with my trusty Caleb as her guard dog. P.S. The pics are again courtesy of James Gill who had this really incredible camera! 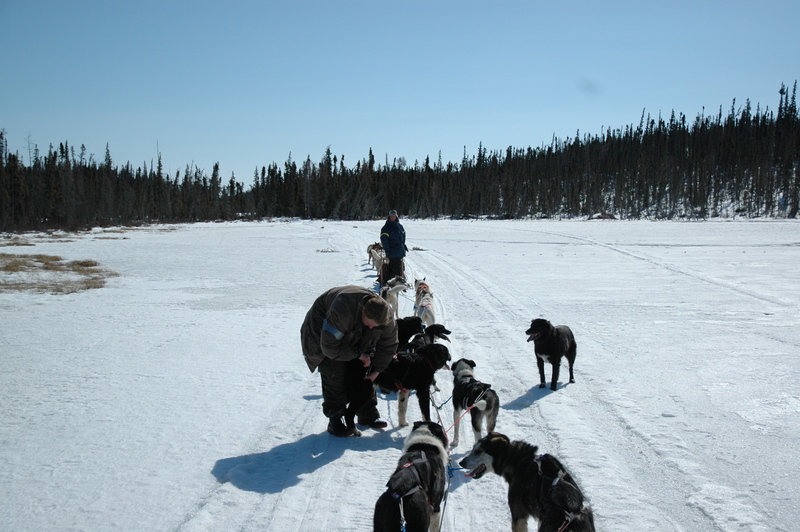 This entry was posted in Uncategorized and tagged Alaska, dog mushing, Great Slave Lake, Northwest Territories, spring. Bookmark the permalink.